This light and airy home is perfect for families, business travelers, or those seeking a home base for an authentic Texas experience. The house has been fully renovated and features three bedrooms, one with a king bed and two with queen beds; a private master bath (with an oversized shower), and an additional full bath with tub and shower. The kitchen is stocked with everything that you need to cook meals; range, microwave, dishwasher, fridge, plate, bar ware, coffeemaker, coffee grinder, teapot, mixer, toaster plus all the serving dishes and utensils you will need. The living room has a big-screen TV with expanded cable, Netflix and Amazon Video, with wifi throughout the home. The utility room has a washer and dryer and is stocked with detergent, bleach and dryer sheets. Off the utility room is a single car garage. There's a fenced backyard with a covered patio with a grill and two rocking patio chairs. The space is decorated with Panhandle themed original artwork and prints. We also provide information on area highlights and attractions, as well as a book collection and periodicals showcasing the Panhandle area. The house is outfitted with an electronic lock, which allows 24-hour check-in times. You will be assigned a customized code upon booking. The house is located in a peaceful, well-maintained residential neighborhood. Centrally located near I-27 with easy access to downtown Amarillo and Palo Duro Canyon, the home is close to shopping and a variety of restaurants. We pride ourselves on keeping the house immaculately clean. We like to wash the linens ourselves to ensure that they are clean and comfortable. We welcome children, but cannot guarantee that the house is child-proof for infants and toddlers. We have a Pack N Play and high chair available upon request. $50 cleaning fee. $200 refundable security deposit required. Small dogs considered on a case-by-case basis--$150 non-refundable deposit will apply. Very clean and decorated extremely cute! Quiet neighborhood with easy access to Amarillo's features. Owner/manager was accommodating and even checked on us during an extreme weather warning. Will definitely be staying here again ! Excellent job Coco! We enjoyed having you very much! You're welcome back anytime! The house is in a great location and easy to get to everything in Amarillo. The house had everything we needed and was in great shape. Coco is super easy to deal with and amazing communication. We will definitely stay here again. We certainly look forward to hosting you again, Louis! You and your group are awesome! 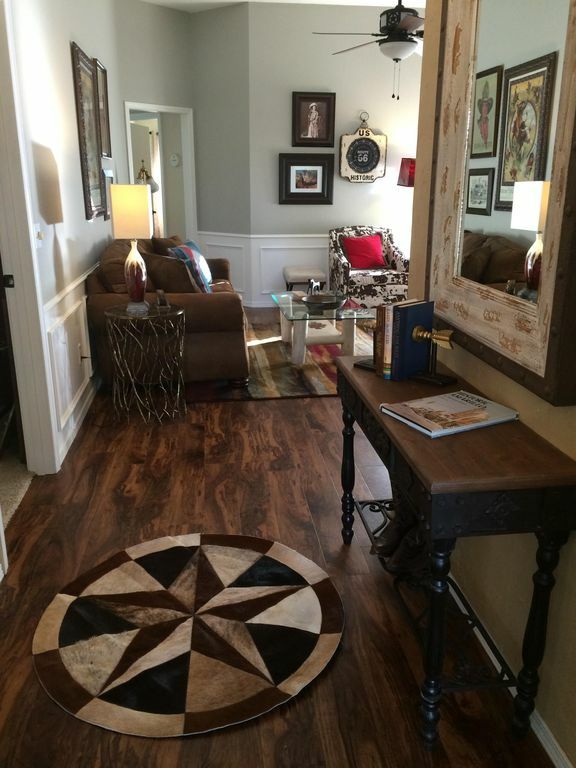 Cozy, clean, quintessential Texas-themed, centrally located home. This home away from home feels just like that, a home. It is neatly decorated and there is great attention to detail and the comfort of its guests. It is warm and welcoming and if you don't plan on leaving during your stay, all you need to bring is your suitcase and some groceries. There are even some basic toiletry items provided. The bedroom and bathroom linens are soft and good quality, the beds are comfortable, and the kitchen is well-stocked. You even have coffee and all the fixings! The house is larger than it appears from the outside. It is a three bedroom, two bathroom home. The master is separated and has an en-suite. The other two bedrooms are in the back of the house and share a full bath. There is ample closet space in each bedroom with clothes hangers. You have access to the laundry room equipped with a washer and dryer with detergent provided. The very clean, fenced-in backyard is perfect if you are traveling with small children or dogs, and it provides a nice place to sit outside and even cookout on the grill. There is a drive-way and an attached one car garage in front of the house located in a quiet neighborhood. Its location provides quick and easy access to I-27 should you want to go downtown or drive over to Canyon. It is also near many shopping and restaurant options. You can truly make yourself right at home as you also have access to Netflix and WiFi. No detail has been overlooked and Coco is a wonderful and gracious host that is easy to communicate with should the need arise. She's a wonderful ambassador of all that it Amarillo should you need recommendations for restaurants, entertainment, or shopping. She is even kind enough to send a message to check on your during your stay. She is the epitome of true Texas hospitality. Thank you! What a kind review, Phoebe. It's so gratifying when an especially nice guest values all the little things that are important to us. You were a fabulous guest - come back often! We could not have asked for a better experience. This home fit our every need. Great job! Thank you for the kind words! You were great guests. We welcome you to come back anytime, Charles. What a lovely, little place & so well done. Owners are very nice & responsive. Neighborhood seems wonderful, and we felt comfortable in every way. A rare find! Thank you so much Phyllis! Your kind words are so affirming. We enjoyed hosting you. Come back soon! Perfect for our group. Clean. Looks newly redone. Had everything we needed.